Precision made Clear Edge Waterwalls are available in a range of different widths and with different lip lengths. Constructed with a strong UV stabilised grey acrylic body and a robust clear edge lip. AQUAEDGE Clear Edge Waterwalls will produce both cascade (wall wash) and projecting sheet waterwall effects and with the AQUAEDGE double baffle system you are guaranteed the most consistent smooth sheet of water. 1. Cascade/Wall Wash - This is achieved where water flows softly from the spillway and cascades down the wall face into a pond or pool. Recommended to install a pump with a flow rate of 50 litres per minute (l/m) per metre spillway width for correct flow at the height of the blade lip. 2. 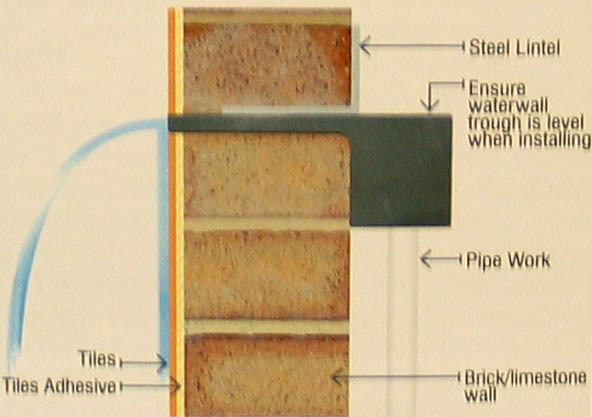 Projecting Sheet - This is achieved where a large volume of water passes through the waterwall, producing a solid sheet of water that projects away from the wall. Recommended to install a pump with a flow rate of 100 litres per minute (lpm) per metre spillway width for correct flow at the height of the blade lip. IMPORTANT NOTE 1: Do not leave Aquaedge clear edge waterwalls in direct sunlight before or during installation. Do not apply torque to the fittings. All fittings and body of waterwall unit need to be supported so fittings or unit are stress free. IMPORTANT NOTE 2: We recommend to not exceed 300mm projection away from lip.